The exquisite creamy complexion of the Regency maid, though a far cry from the powdered beauties of the previous century, required much care, if one wished to avoid, gasp!, a sunburn or freckles. 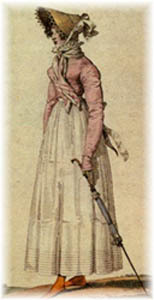 Thus, the bonnet and parasol were essential to outdoor activities. Made of anything from lace to cotton and silk, they could also be effective against light rain. Not quite as "manly" as umbrellas, they were certainly just as practical. The parasol continued to increase in popularity until the Edwardian era. Trimmed with a variety of materials from silk tassels to cotton lace, they were made to complement any outfit for occasion. "Charlotte was to go,. . . & to buy new Parasols, new Gloves, & new Brooches, for her sisters & herself at the Library. . ."